MS Dhoni may be struggling for form with the bat currently. However, former India cricketer Ajay Jadeja feels he should continue to remain in the ODI team for his invaluable experience. Jadeja even went to the extent of saying that the selectors have made a wrong decision by dropping him from the T20 team. Praising Dhoni and calling him the best ODI cricketer of his generation, Jadeja told Cricbuzz, "I think he is the greatest ODI cricketer in my lifetime. At least what I have seen in my lifetime. In this series we said what have we gained and what have we lost? 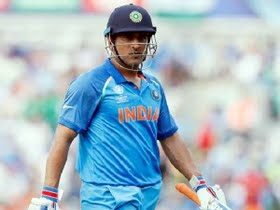 I think we have lost MS Dhoni as a player in T20Is, thanks to those selectors,"
Dhoni has been having a poor time with the bat, scoring just 77 runs in 4 innings in the Asia Cup and 50 from three against West Indies.